By popular demand after our last dinner at Morningstar, I have been requested to post the recipe for this colorful veggie mandala tart! As the technological speed of modern society increases at exponential rates, so has the experience of early childhood been radically altered. Children are faced with increased levels of cognitive stimulation and complexity from their early years. The statistics of the incidence of childhood mental health disorders, such as ADHD, are rising. As the very landscape of childhood has shifted so dramatically since parents and teachers were themselves children and is increasingly characterized by continuous change rather than by stability, in what ways must educational approaches adapt to help children to successfully integrate these experiences and reach their full human potential? Is cognitive development in itself sufficient to guarantee happiness, or does conscious attention need to be given to the development of social, emotional and spiritual competencies? How to facilitate the development of an internal “compass” to prepare children to navigate the challenges of a technological, commercialized culture? 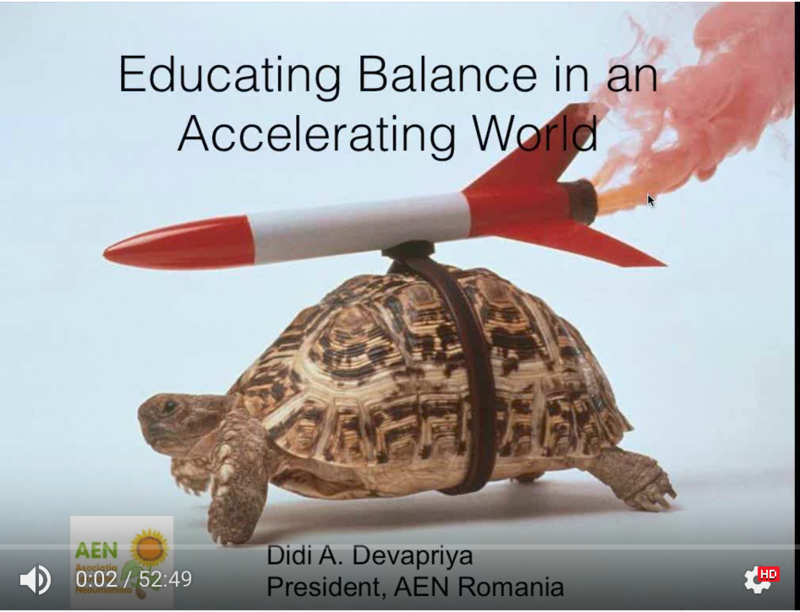 This webinar explores these questions according to the holistic approach to early childhood development offered by Neohumanist Education. It examines the ways that Neohumanist education balances extroversial sensorial stimulation and cognitive development, with training in introversial capacities such as self-regulation, empathy and creative visualization. The Neohumanist teacher’s own subjective experience and self-development is seen as an inseparable part of the teaching process. 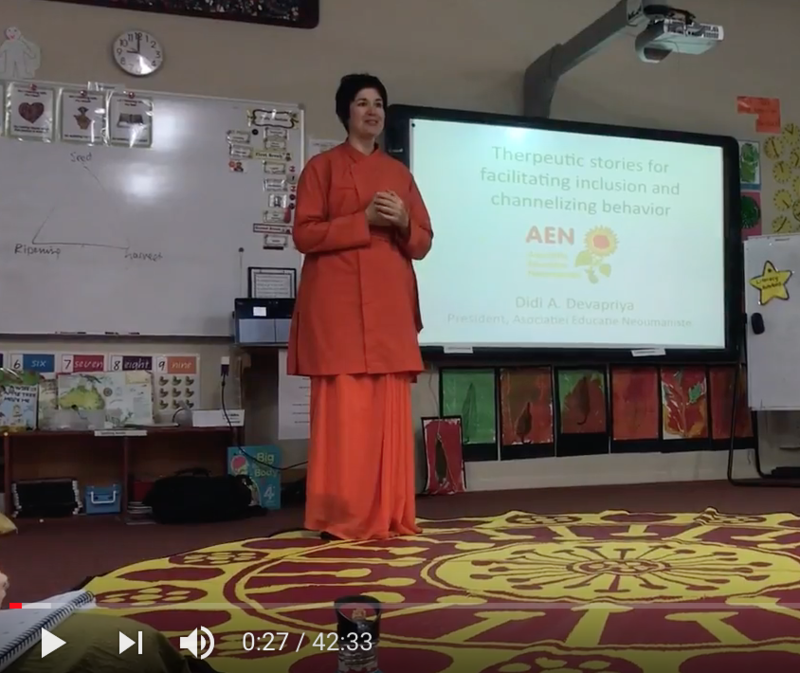 This webinar looks at Neohumanist Education’s synthesis of classical eastern wisdom teachings from the ancient tradition of yoga that highlight personal development and collective values with modern western progressive educational techniques that cultivate rationality, logic, and individual creative expression. The holistic vision of Neohumanist education is essentially an ecological vision that honors the interconnectedness of the web of life, seeking to preserve children’s sense of being connected to a greater whole, engage them in learning as joyful discovery, and help them discover meaningful ways to contribute to their world. The program was organised in order to launch a beautiful book about yoga that has been translated in Braille. The embassy generously donated copies of the book to the Association for the Visually Impaired of Romania – I happen to know the president from a training that we took together about social enterprise, so it was a pleasure to reconnect with him as well. Here is the entire news story that appeared on television, for those of you that can understand (or guess at) Romanian! This recipe has been a favorite of mine for many years – it makes such a light and fluffy cake that is luscious, dark and rich in flavor, but surprisingly low in fat. Most people are convinced it is a dark chocolate cake – as the barley coffee gives it some of the bitterness of chocolate. It is the chemical reaction between the vinegar and baking soda that makes this cake rise, and which is one of the secrets of making amazingly light, delicate, egg-less cakes. As the vinegar reacts with the baking soda, its flavor is neutralized, forming bubbles of carbon dioxide and water, so don’t worry- you won’t taste it. Just make sure to preheat your oven so that you can immediately bake this cake. Mix all dry ingredients together. Add the oil and water, beating the batter until well mixed – it will be a very runny consistency. Add the vinegar at the end, and only when the oven is already hot (approximately 350 degrees) so that the cake can immediately be put in the oven, while the baking soda and vinegar are reacting and causing bubbles in the cake. Fold in the walnuts. Spoon into a greased or lined muffin tin, and then bake until done (about 30 minutes). Melt the butter over a low flame and then add the other ingredients, whisking until smooth and shiny. Glaze the cupcakes when slightly cooled – if they are too hot, the glaze will simply melt off, but some warmth helps it to spread easily. 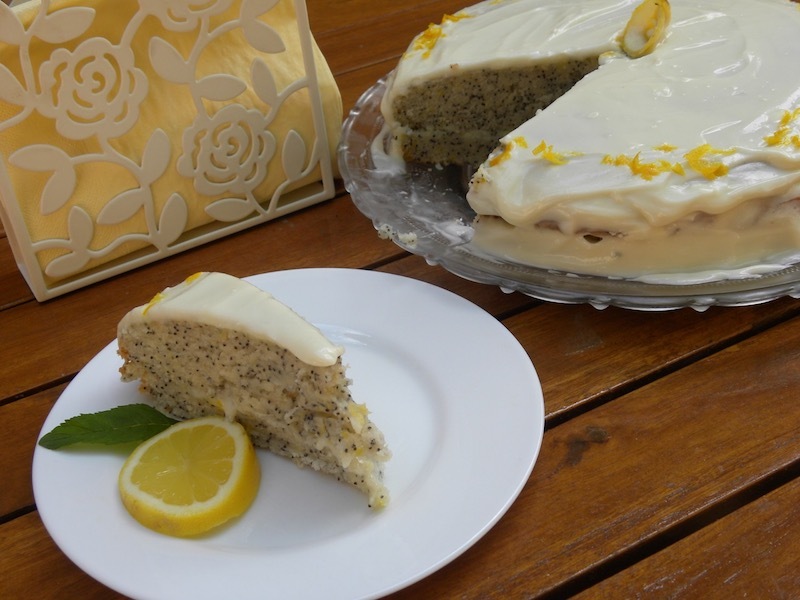 Lemon is one of my favorite flavors and the combination with the velvety cream cheese frosting is luscious. The addition of the lemon rind in this cake gives it a beautiful color, which often surprises people when they discover that it is made without eggs. Let butter soften. Beat the cream cheese and then add softened butter. Add vanilla extract and then slowly add sifted powdered sugar. Stir in lemon rind at the end. Refrigerate to allow it to become more stiff as the butter cools. Cool the cake completely before frosting. 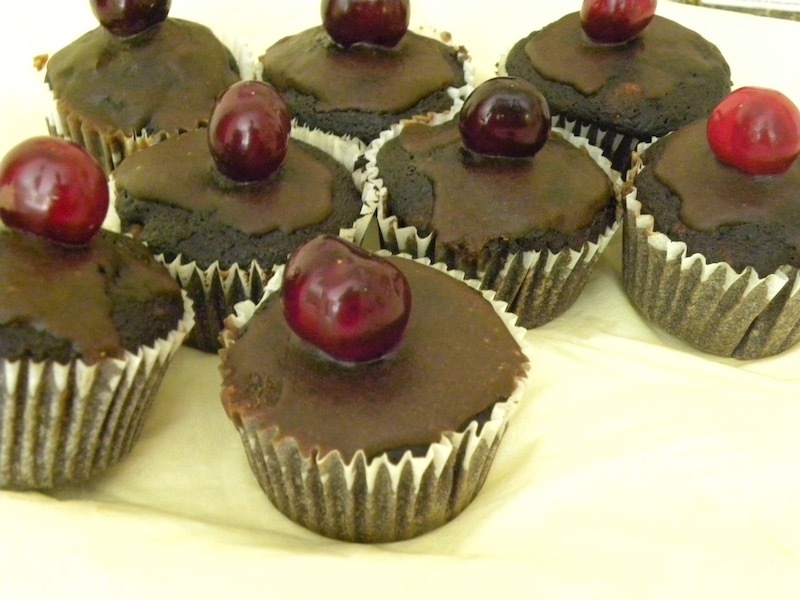 This cake can be made also as cupcakes. 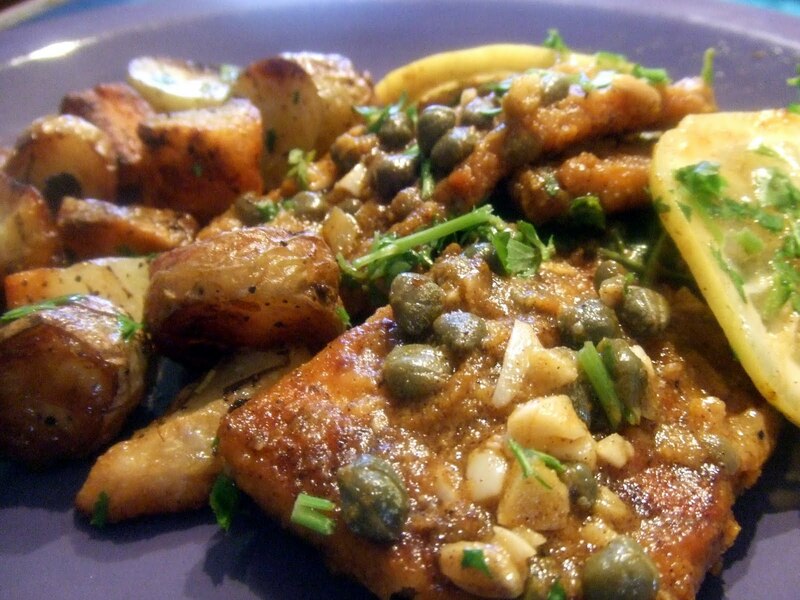 Lemon, butter, pepper and capers give this tofu picatta dish a fresh, tart, springtime flavor. It was featured at our April dinner at Morningstar. Together with steamed asparagus and oven roasted rosemary potatoes, and an organic salad from our AMURTEL Bio Garden, it was a lovely introduction to spring! Drain and press out excess water from the tofu. Combine 1/2 teaspoon of salt, 1/2 teaspoon pepper and a dash of asafoetida (or to taste) with chickpea flour and then coat the pieces of tofu in the flour mixture. Heat 1 tablespoon of butter and 1 tablespoon of olive oil in a skillet. Add about 1/4 teaspoon asafoetida. Pan fry the tofu until golden brown and then remove. In a clean skillet, heat 2 tablespoons of butter and 2 tablespoons of olive oil. Add 1/4 teaspoon of asafoetida, and the sliced lemons. Allow the lemons to cook. Add the vegetable broth or water, capers and ground pine nuts (sunflower seeds also work). Add salt and pepper to taste. Add the cooked tofu and then add parmesan and garnish with parsley. This is a luscious, moist cake with warming spices, so especially suited to cool weather, though it is popular at any time of the year. I often make it at Christmas parties. 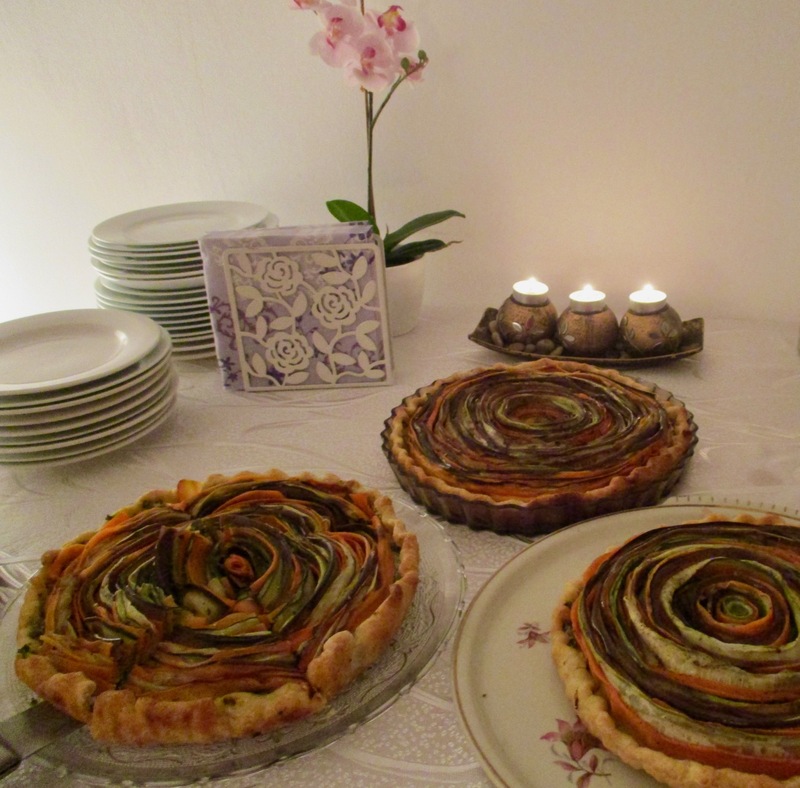 I also recently made it for a birthday party in Spain during the Youth in Permaculture meeting. In fact, this posting is inspired by their requests for the recipe…There I used a kind of “fromage frais” instead of cream cheese, and it was delicious. The cake is vegan, and though the frosting is not, I have included a link to a vegan cream cheese frosting as well for my vegan friends! Preheat oven to 175*C. Butter and flour a cake pan, or line with baking paper. Combine the dry ingredients: flour, baking powder, baking soda, salt and spices. In a large bowl beat the oil, vanilla and sugar until light and fluffy, and then add the mineral water. Gradually add dry mixture into the wet ingredients. Add carrots. Gently fold in nuts and raisins. Pour into prepared pan and bake for 1 hour. Check for doneness. A toothpick inserted should be barely moist when inserted in the middle. Place on a cooling rack to cook. After 10 minutes invert the cake out on to the cooling rack. Allow to cool completely before frosting. 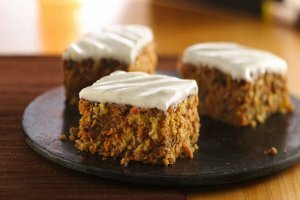 *Note for Vegans: As this cake is actually completely vegan, the cream cheese frosting can be eliminated, dusting the cake with powdered sugar if desired or here is a nice vegan option made with cashews!). 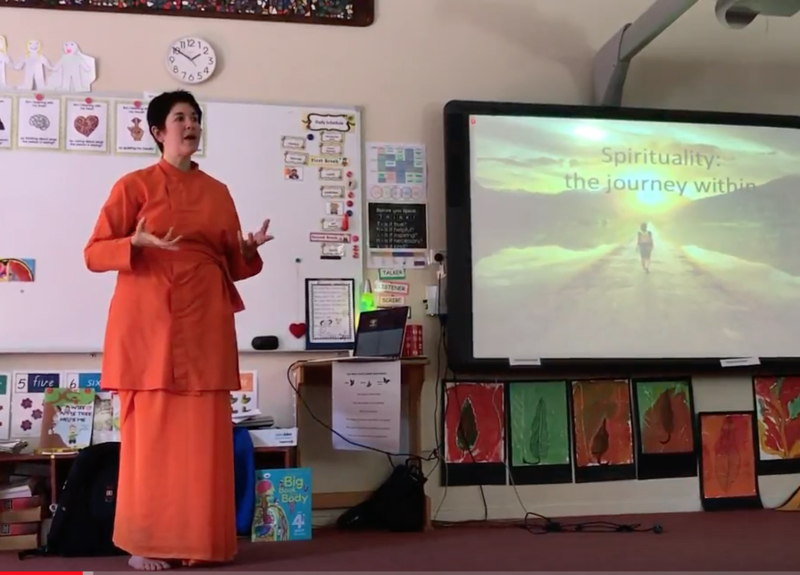 One of our Qigong students, Roxana Iordache – turned out to also work in television – and she came to Morningstar last week with a film crew to make a short intro piece about stress management.